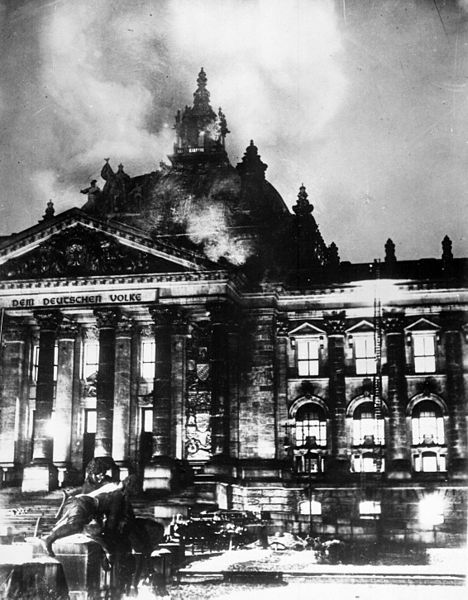 On this day in 1933, the German Reichstag (parliament) building was set ablaze in an arson attack. The Nazi Party blamed a Dutch communist, Marinus van der Lubbe for the attack, and he was tried and executed a year later. Seeing an opportunity, the Chancellor Adolf Hitler persuaded the President, Paul von Hindenberg to pass an "emergency decree" limiting civil liberties and allowing the Nazi Party to target and eliminate German communists. To this day, historians debate whether or not van der Lubbe was truly responsible, whether he acted alone or even if the whole incident was staged by the Nazis as a cover for restricting civil liberties. You can read more about the fire at the US Holocaust Memorial Museum site. If you choose this topic for your project, you'll have a huge amount of secondary sources to choose from in your local library, and if you have access to newspaper archives, you should avail of them - this fire was reported around the world.